But Hugh Jackman, the celebrated Australian born actor, certainly wasn't all zen to begin with. ''I've seen that because I'm afraid of fear, I sometimes deny it and say to myself, 'Oh, I'm not afraid of this, I'm fine,' as a way of hoping that'll make it go away,'' Jackman reveals. ''Meditation makes you see very clearly what goes on in your mind, its machinations. So, in some ways I see more of it—the low-level anxiety—because I'm more aware. And the high-level anxiety just calms down,' Jackman explains. ''If every time you're going to say the word 'stressed' you say the word 'scared' then you admit what's going on and it's much easier to solve,'' Jackman notes how we sometimes try to stick our heads in the sand. ''I still get frightened by things. There is a level of fear, level of stress,'' Jackman admits, ''I suppose what meditation has given me is the ability to not only cope with it, but to accept it. ''I would say possibly equally to how marriage and kids did—I would put it right up there, in terms of things that have affected my life. I was always very curious and very much a searcher, but soon after I started meditating, I felt I gained a true understanding of myself and was no longer just being reactive to events that came my way. ''I'm an actor, so a lot of my life is putting on other masks and other personalities and looking into them. But, of course, for the actor the real power is finding authenticity no matter what character you're playing—and being. ''You cannot really move forward as an actor until you understand who you are as a person, and understand yourself. And then you branch out to understand others. So, authenticity is something that actors in particular—but I think anyone in a creative field—would call the Holy Grail,'' Jackman points out. ''I like the analogy of a glass of water . . . when you first pour it it's cloudy. When you're stressed, that's what your mind is like, it's kinda cloudy. And after I meditate all that sinks to the bottom and the water is clear and the energy is finer, and the decisions you make are more authentic, and I think you're more economical with your energy, with your time, in every way. You're more able to listen to other people. ''And as an actor, that's all you got. Your only tools you really have are being present, being clear, and listening. So, it helped me in every way, immeasurably,'' Jackman explains. Before taking on TM, Hugh often foundÂ work related stress spilling over to his personal life. No longer getting lost in these stressful thoughts has certainly also benefitted Jackman's marriage. 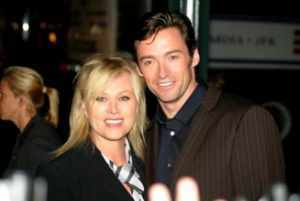 A PERFECT MOMENT: ''It had been raining,'' Hugh Jackman recalls the breakfast when he had decided to propose to Deborra. ''Finally the sun came out, and I didn't have a line! I was thinking, 'Come on, come on, come on, you've got to come up with something, this is a once-in-a-lifetime, you've got to come up with a line'. And I said, 'Baby, look the sun's come out - it's almost perfect!' and she says, 'What do you mean? It is perfect!' And I said, 'Well . . . it will be if you marry me!' And I pulled out the ring,'' Jackman recalls, smiling. For Jackman, meditation is not about making him into a whole new person. Rather it's about uncovering who he really is. And it's not just to feel good and all blissed out while he practices TM. ''As I've heard it said beautifully: the mind is a wonderful servant but a terrible master and most of us live with our mind mastering our day: I've gotta do this, I've gotta do that, I worry about this, worry about that I should have, I shouldn't have. Actor and activist: Off the screen, Jackman is a long time proponent of small business loans used to finance start-ups in developing countries. He has recently also launched his own brand of fair trade coffee and tea to help break the cycle of poverty for African farmers. Over the years, Jackman has also one by one bust all the excuses one can make for not meditating, be it person's faith or lack of time. ''Anyone can do it. You can be an atheist who meditates, a Christian who meditates, a Muslim who meditates. It's like saying, 'Is walking a religious thing?' No. It's available to anyone, and the quality of your life is changed forever,'' he explained. ''Everyone takes a shower every day, and we don't complain about it. We do it out of discipline. There will always be an excuse not to meditate. . . . The ego says, 'You don't need to meditate, man. You're really busy. What about the kids?' But do I say, 'I can't shower today because I have to make time for the kids?' No,'' Jackman points out. Hugh Jackman and his wife have both been great supporters of the work David Lynch Foundation (DLF) — an organization dedicated to teaching meditation to at-risk populations. ''To be at these events is one of the most emotional experiences one can have because you see people's lives saved literally and changed forever, through this simple technique,'' Jackman says about DLF's benefit concerts.